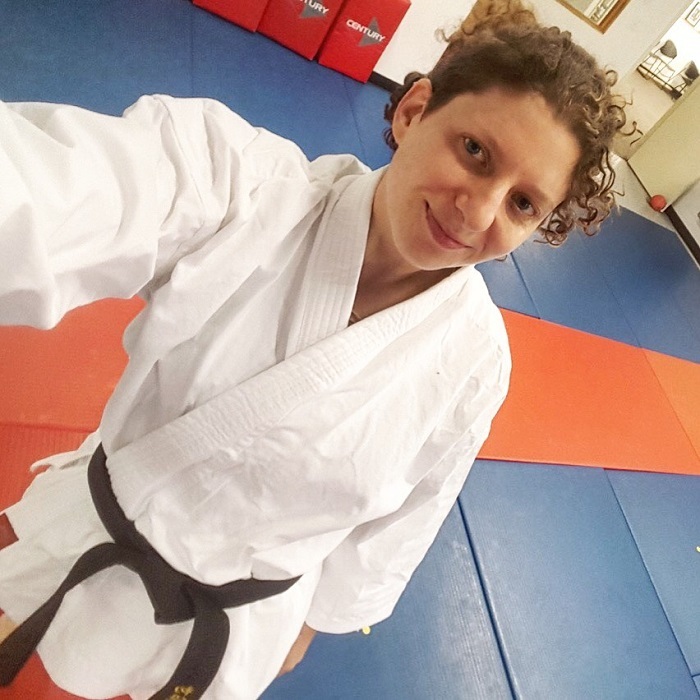 For those of you who I have not had the opportunity to meet yet, my name is Laura Kleiman, and I am excited to be joining the Kime Karate Team! Over the summer I started training and I teach classes at the dojo on Mondays and Thursdays. It has been so much fun and an honor to work with all of you! Thank you to Sensei Keyes and his wife Pamela for bringing me into the Kime Karate family! I met Sensei Aric Keyes nearly 20 years ago when we trained together. I trained for about a decade, but then school, career, and a few relocations caused me to put my training on hold. When I moved back to the Rochester area, one of my first stops in town was Kime Karate. Over the years I have trained in many styles and at many schools, but I feel a strong, personal connection to the conceptual and philosophical teachings at Kime Karate. I firmly believe that all styles are created equal, but some are a better fit for certain individuals. Personally, I appreciate the intuitive quality and practicality of Sensei Keyes’ curriculum. Furthermore, I enjoy the atmosphere of inclusivity, group learning, and respect fostered in each class. Every individual who walks in the door is welcomed with kindness and without judgment. Sensei Keyes’ passion for martial arts is only surpassed by his dedication to his students and school. I am beyond honored to join the Kime Karate Team as an Instructor. Thus far, it has been an exciting and rewarding challenge to incorporate the methodologies and concepts that Sensei Keyes has developed into my own training. As a result, I’m most excited to learn with the students and staff at Kime Karate. I plan to approach all of my training, whether I am instructing or attending a class, as a learning experience. A little bit about me… I grew up in Fairport and have lived in the Rochester area most of my life. Currently, I work at the Rochester Institute of Technology as a Research Administrator and I live in the City with my dog, Walnut. 🙂 I started training in martial arts when I was around 10 years old. Even though I took a substantial hiatus from my training, one thing has always been clear to me, martial arts is a way of life. Even when I have not been training regularly, I have always identified as a martial artist. Once you begin this path, it becomes a part of who you are. I am eternally grateful for all of the instructors and students that I have worked with over the years, especially Sensei Keyes, they have not only contributed to my development as a martial artist, but have helped mold me into the person I am today. Please feel free to introduce yourself and say hello. I have been meeting so many new, friendly faces, it is difficult to keep track at times, so please excuse me if I forget a name or a face. I don’t have the words to explain the appreciation I feel towards Sensei Keyes and Pamela as I join the staff, but I do hope to show it through my dedication to the students instructors of Kime Karate.